Are you on Twitter? Are your students' parents and families? Did you answer yes? Very techy. No? Are you living under a rock? ...OK, that was mean. But, this is the 21st century. According to Twitter's blog, 140 million tweets are sent a day which adds up to a billion tweets every eight days. Yes, I just quoted a billion. What's everyone talking about? 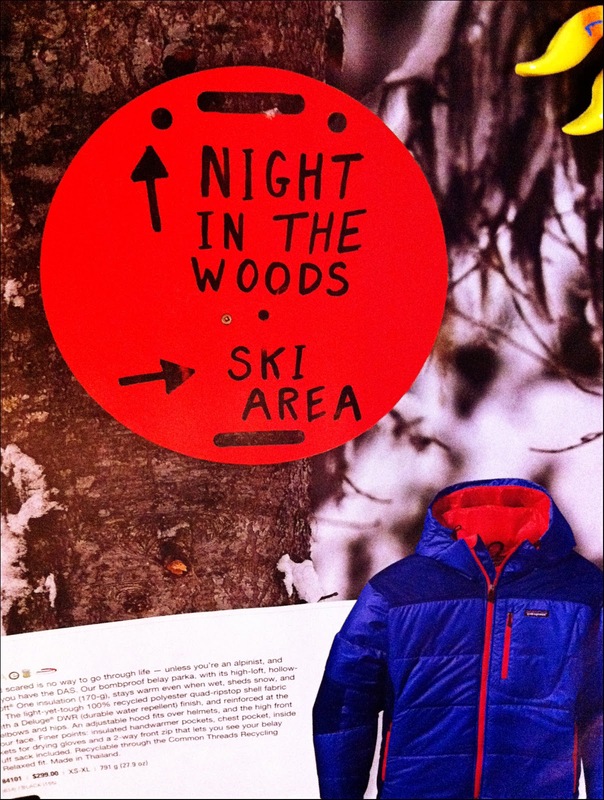 Life, love, the pursuit of happiness, favorite coffee drinks from Starbucks, what's on the dollar menu, how much snow dumped on Colorado's ski resorts, education, why Trader Joe's is so cool, Pink's new song...wait, did I just say "education?" Rewind. Yes, people are tweeting about education. 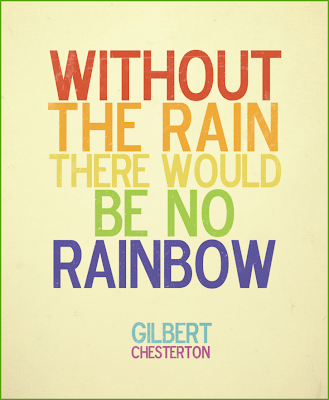 One of my favorite educational tweets is from Edutopia (George Lucas created this foundation, so you know it is cool). You can visit (or follow) their tweet here. Why not tweet in your classroom? 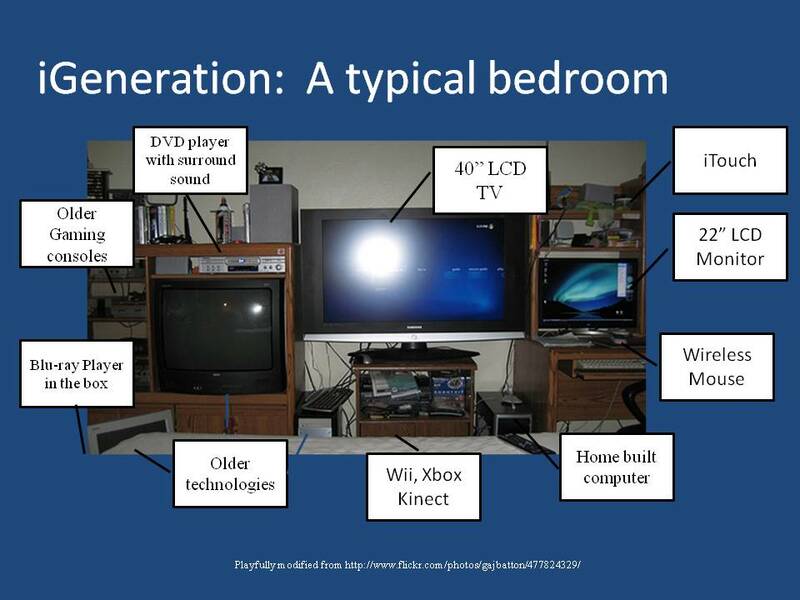 Oh, I know what you are going to say, you don't have enough computers, iTouches or smart phones. No problem, I made you a tweet exit ticket. See? You can go old-school with this download and print it on paper. Voila, a paper tweet. To get yourself a full page of these tweet-a-licious reflection tools, click on the image below. ...I'm kind of sassy today, aren't I? PS - In case you liked yesterday's post on cloud computing and Common Craft, you might also like this video made by Lee and Sachi explaining Twitter. I am helpful and sassy, yes? 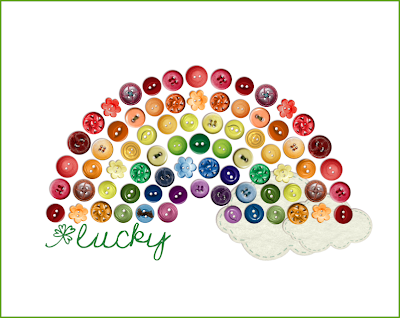 Are you hooked on Common Craft video tutorials like I am? I swear they tickle me. Lee LeFever and his wife, Sachi, are genius in my book. They take misunderstood topics like cloud computing, as an example, and make them 100% digestible to us, common folk. I have enjoyed their videos for years. The earlier videos have more corny hand movements in them. I must say, I miss the corny hand movements. The newer videos, however, tell the story so efficiently. Take this one on social media. B-r-i-l-l-i-a-n-t-!. And finally, to understand the it-is-the-rage-of-most-tech-discussions-these-days, do watch this video on cloud computing in education. You don't want to be left behind, do you? 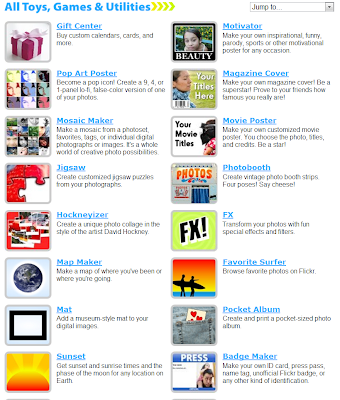 I'm off to watch more videos on the Common Craft website and Youtube (search words "Common Craft"). ....I'm back! I didn't realize Common Craft creates non-tech videos, too. This one on Project Based Learning is fantastic. 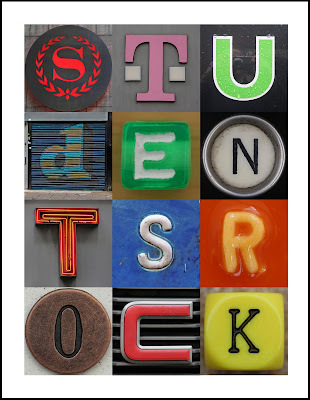 I had not heard of the Buck Institute for Education - dedicated to Project Based Learning. S-u-p-e-r.
Yep, you learn something new everyday. I may be ahead of myself as we have not yet covered emotional intelligence, but I think this post goes well with our discussion on poverty and yesterday's post about helping kids from poverty. With that said, let's chat about Dr. Stephen Covey's Emotional Bank Account metaphor. By the way, today is less "theory" and more bright idea. Dr. Covey has a metaphor that I consider when I am working with students or little O (and sometimes manage to forget when talking to my husband after a long day). Sad, but true, on long days. Dr. Covey calls it a person’s “Emotional Bank Account.” Basically, each person you come in contact with has an emotional bank account - just like a financial bank account. 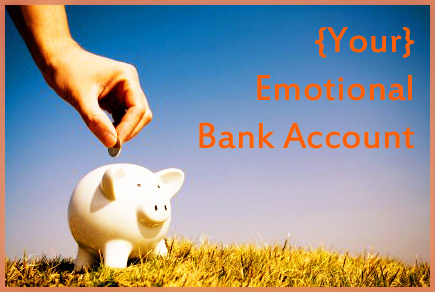 A person's emotional bank account accepts deposits and withdrawals. Deposits are kind words, thoughtful feedback, a smile, love, kept promises, courtesy, respect, patience or a listening ear. Withdrawals are negative comments, sarcasm, broken promises, lies, impatience and the list goes on. Special note: Each person values different things, so these lists of deposits and withdrawals will vary person-to-person. Each time you interact with another person, you have an opportunity to make a deposit or withdrawal into their emotional bank account. Which one will you choose? How are you making deposits in your students’ emotional bank accounts? For students from poverty, how can you make deposits to their emotional bank accounts knowing financial deposits, from a teacher, would be an anomaly? Are you happy with your current “banking activity" overall? If you want to students to embrace this metaphor, as well, consider this activity from Covey’s Google e-book. The activity is for young kids, but it could be modified for any age, in my opinion. It comes from Dr. Covey's book the 7 Habits of Highly Effective Families. ﻿If you need a good person to practice deposit making, choose a family member or loved one, as your guinea pig. Don't tell my husband, but I am secretly practicing emotional bank deposits on him. And no, I don't think he reads this blog, so my secret is safe. Mums the word. 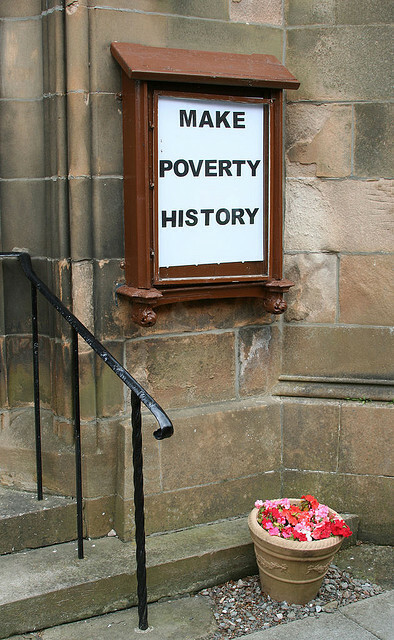 This is Part II of our discussion on poverty from last week. If you didn't read that initial post, click here. Today, we will arm ourselves with creativity and ideas from academia to help students from poverty succeed in our classrooms and beyond. Roots and Wings - Help students feel deeply rooted in their communities (families and schools), yet have strong wings to attempt new adventures and opportunities. The best way to grow strong roots is to embrace the "it takes a village..." philosophy. 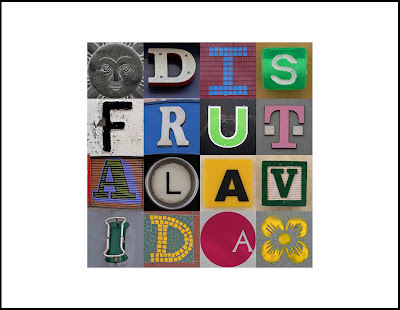 When mom, dad, grandma, cousins, aunts, uncles and caregivers are involved in a student's schooling and school, roots naturally become strong. To help students grow wings, look at enrichment opportunities in your area or in an interest. For example, if you know a student has an interest in outer space, could you find a mentor in your area (or via email) to buddy-up with your student and share their space expertise with them? Or could you help a student write an essay to secure a scholarship to "space camp" for the summer? Roots and wings...foster them both. 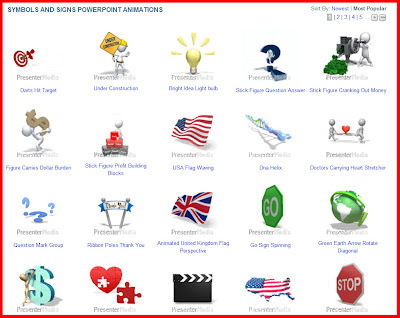 Developmental Assets - Remember this post on the Search Institutes's developmental assets? This is a great way to help students from poverty as it is not about finances, but about other supports to help students. Remember the more assets a student has, the more likely the student will not engage in risky behaviors. Consider going back to this original post and printing off the developmental asset sheet for your students' age range as a reminder of which assets should be fostered. 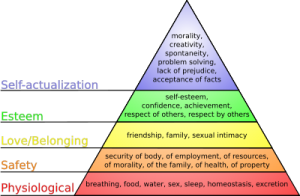 Maslow's Hierarchy of Needs - Since poverty affects the foundation of Maslow's hierarchy of needs, brainstorm ways to help students get their "deficiency" needs met. For example, if a student is homeless, can you have the address handy for a local homeless shelter and slip it privately to them? If the student does not have a safe or quiet place to complete homework, could you open up your classroom 2-3 afternoons or early mornings a week for students to use the space as a study hall? Mental - Basic academic skills like reading, writing and mathematics; necessary for promotion in school and business. Physical - Having adequate physical health and wellness. Support Systems - Knowing that a strong network of family and friends exist and can be supportive. Relationships/Role Models - Having access to nurturing adults who model appropriate behaviors. Knowledge of Hidden Rules - Knowing the unspoken rules of a group. An example may include writing a thank you note after a person does something nice for you (a very middle-class rule). My grandmother would be saddened to know I still have not written thank you cards for gifts received over the holidays - four months ago! As a teacher, you need to explicitly teach the hidden rules to your students from poverty if they do not know them. Financial - Having enough money to purchase goods and services. According to Dr. Payne, three or fewer resources for a student is problematic. Mirrors and Windows - Surround students with good people and growth experiences that allow them to see themselves in a clear light (and see others who are just like them), while providing windows to see beyond their immediate situation or neighborhood. When I taught on the Navajo Nation, I comfortably provided many windows for students to see beyond their lives on the reservation, but since I am not Navajo (read: not a great mirror), I sought alternative ways to provide mirrors. For example, how can students see themselves in a book character or a time period in history? Which chemical element is most like them? If you need help with mirrors, try what I did and connect mirrors to your subject area or content. I believe this would be a fantastic post to hear from you in the comments section. 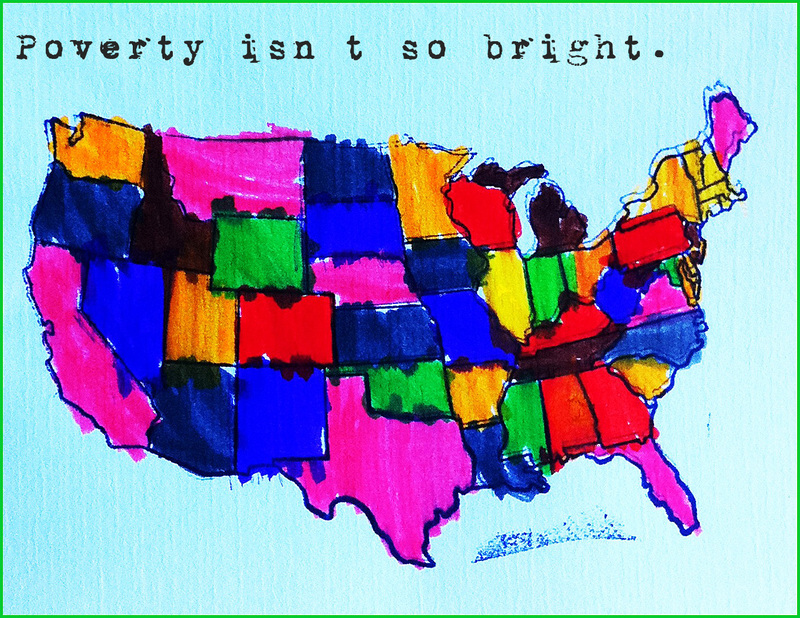 What other ideas do you have to help students from poverty? I read a ton of blogs. Some educational; most of them not. What I like most about my favorite blogs is the text is limited to a paragraph or two with plenty of visuals. Today, I will attempt to follow that. Online Stopwatch is a simple collection free, web-based stopwatches, timers and clocks. No log-in or username is required. You just choose a favorite stopwatch, set the time to count up or down and off you go! I like to use this free resource with students when they are working in small groups. I usually have the stopwatch count down the time. With it flashed on our big screen, students can easily see how much time is remaining to work with their group mates. 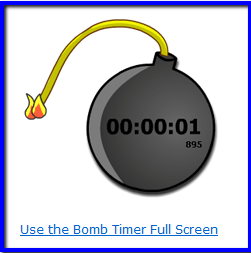 This one, a favorite of students, is the bomb timer. It does ring at the end, but does not sound like an explosion. 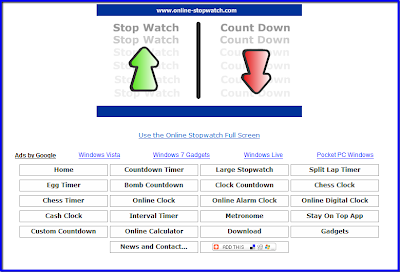 See which stopwatches, timers or clocks you find useful at Online Stopwatch. ....Pretty good at limiting my text today, wasn't I? Please forgive me, English and Language Arts teachers of the world. And yes, I realize I am one. I know this blog is riddled with typos and grammatical challenges. I need an editor, indeed. Any volunteers? 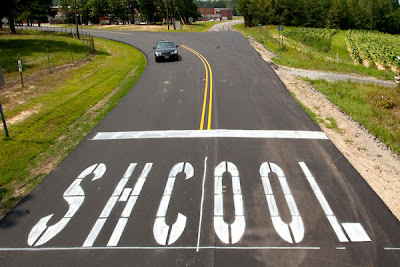 And just to make myself feel better, at least I didn't plaster my mistakes on a roadway. See? Things could be worse. Many of you know my background from reading my initial post here. If not, I have taught in a hodgepodge of amazing places both in the US and abroad. Here are some leads and tips for landing a job abroad. Attend an international teaching fair. Two of the biggest are the UNI Overseas Recruiting Fair and the ISS Fairs. Both organizations offer fairs in February, thus, I'm planting a seed for next year, 2012! I attended the UNI fair a decade ago just to see what the fair would be like and literally landed six jobs all in South America, my targeted destination. Both fairs require you are a certified teacher. The fairs also require an application fee. What I appreciated about the fairs is they mean business! The international schools in attendance are ready to hire - impressive schools from all parts of the globe - Switzerland to China to Ecuador and beyond. Before the fair, prepare! Research schools, countries, curriculum, special programs, etc. 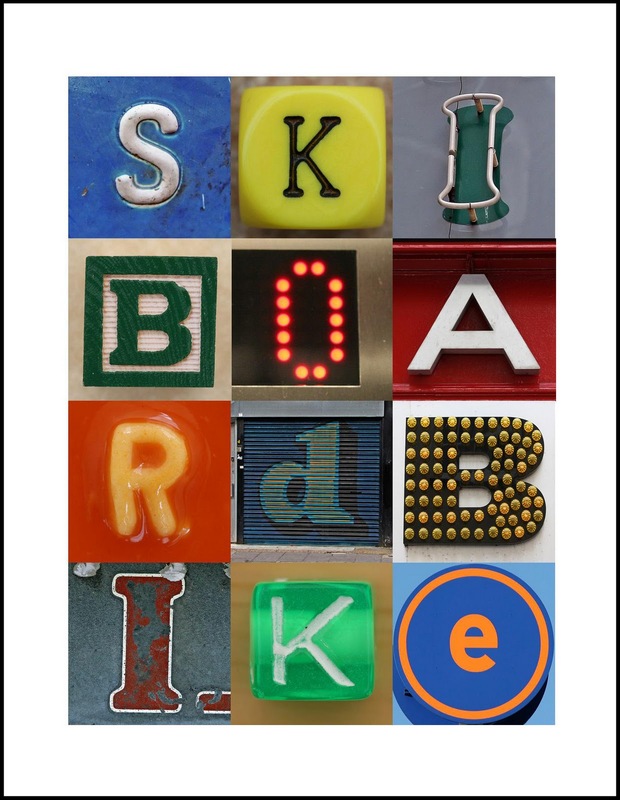 Many schools abroad have IB programs, so familiarize yourself with those if you are not already savvy. In your research and at the fair, target an area of the world you'd like to teach or be open to many areas of the world. For me, I only wanted to live in South America (a life-long dream of mine at the time) and thus, I focused on job positions there. I didn't even apply to positions in other countries while attending the fair nor entertain requests to interview with other countries. And yes, many schools will seek you out to interview as they all have access to your resume and credentials. I must say, it felt really great to be wooed by schools. At the fair, be ready for long days! You will need to dress professionally, have extra resumes on hand, possibly bring your teaching portfolio (more on this in a moment) and arrive to the fair ready to shine! You need to be your most engaging self while at the fair. Get a great night's rest. Most job fairs are multiple days. I did land all six jobs in one day and thus, the second day of the fair was spent determining which job offer to accept - which is awfully exciting. However, many of my comrades were interviewing and scouting out schools on the second day, so be open to a busy fair schedule. I only advise bringing a current teaching portfolio if you plan to use it. I like to use my portfolio (which could stand a major revision and update) when a prospective employer asks me a question that I know my portfolio (and I) can address. I then will flip to the part of my portfolio that demonstrates my response to their question and the employer can visually see my response while I describe it. For example, if an employer were to ask me about assessment, I could flip to my assessment section and show some of my original assessment tools and assignments. 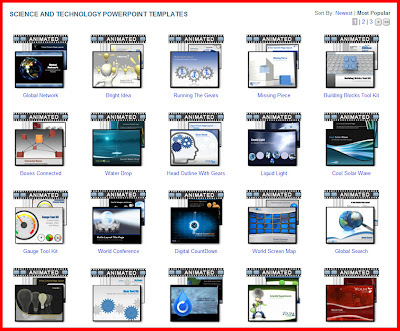 Seeing is believing sometimes and that's when portfolios are most helpful. 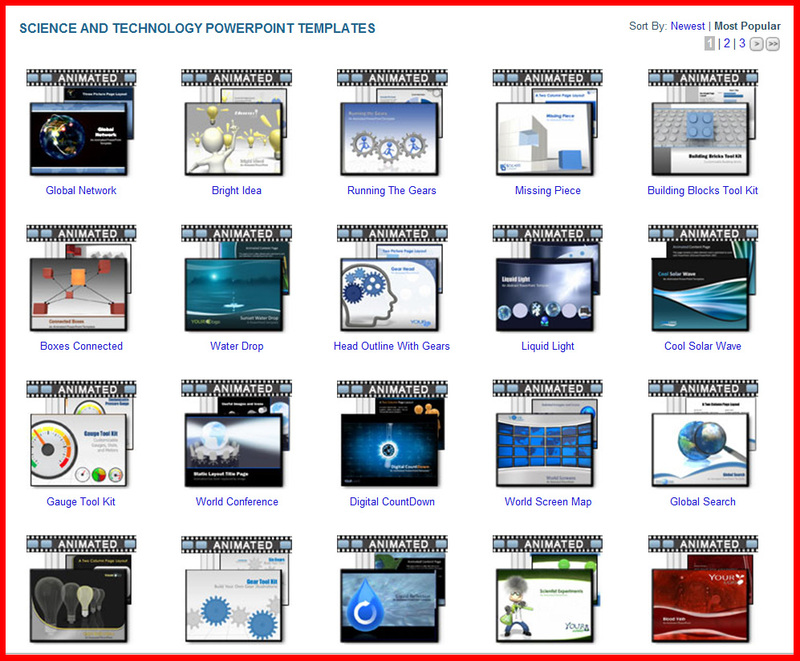 If you have an electronic portfolio, use it if you can easily access the artifacts. You certainly don't want employers to wait for you to locate and open your documents or photos. After your interviews at the fair, bring thank you cards to hand write to the schools who interviewed you and leave them immediately for your prospective employers. 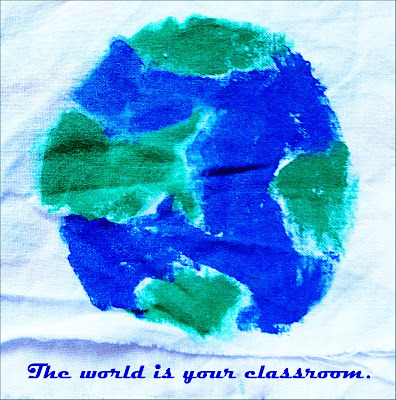 I made my own cards that said, "The world is my classroom," on the front. Thank you cards help put your name in front of the prospective schools one more time. If you are married or in a relationship with another educator, you can also apply and interview as a team. Most of the fairs have a system for doing so which makes interviewing and landing positions together doable. If you are married to a non-educator and/or have children, most international schools have systems to hire you and have your family accompany you with ease. US kids growing up in international schools have a unique opportunity to see the world, learn new languages, and travel. Win-win-win. This is not my expertise at all, DOD schools, but I do know of educators who have enjoyed working at DOD schools. According to the DOD website, you can target an area of the world that interests you and explore current job postings. Most DOD schools are located on military bases and attended by US students only. International schools, alternatively, are mainly attended by locals from that country - which is my preferred clientele while teaching overseas. If you are not quite ready to make the jump to another country, consider staying in the US, but teaching in another culture. If you are from a rural area, consider teaching in an urban setting. If you are from a Hispanic community, consider teaching in a predominately Asian one. 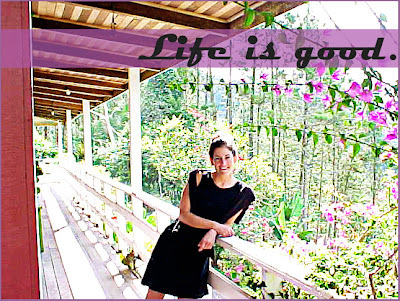 In the US, there are many opportunities to immerse yourself in new cultures and environments. My personal favorite spot to teach in the US is in Kayenta, Arizona on the Navajo Nation. Gosh, I adore my Navajo high school students and their families. Thankfully, many of my students from a decade ago still keep in contact with me. This school district, Kayenta Unified School District, was superb and each year, they look for dynamic teachers. You can see their current job postings here. If you have any questions on landing a job overseas or even teaching on the Navajo Nation, please email me at jenglara at gmail.com or leave a comment below. Understanding how to subscribe to blogs is a "must have" skill for the 21st century as blogs are the "new" magazines of the times. Unfortunately, the process is confusing to many would-be-subscribers. Let's break it down. 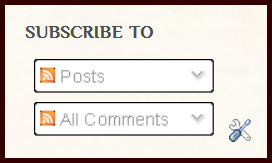 Most blogs will have similar features for subscribing and sharing. Be open to slightly different icons, but the functionality generally remains the same. 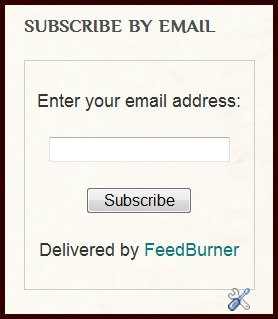 If you haven't subscribed to Upcycled Education, practice subscribing using one of the ideas above and see what you think. Remember, this blog ends in mid-May - bittersweet, I know. Daniel Pink's work is required reading in my edutopia. My personal Drive copy is plastered with handwritten notes in pencil. I am certain there is a positive correlation between the amount I write in a book and a book's sustenance. Mr. Pink, hats off to you for your collection of research, your infused interpretations and "toolkits." Turning theory into practice is relatively easy for self-proclaimed "busy" people like me because of them. 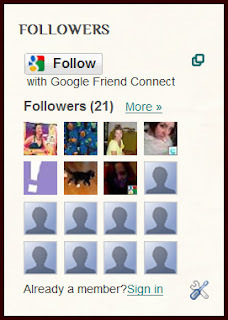 ...Evidently, not too busy to keep up a blog each week. Do you believe Upcycled Education receives about 500 page views a week? All you, lovely educators and allies....thank you. Though, I could blog for the next ten weeks about Pink's work and Drive, I will share with you just a few highlights as I really want you to read Drive. By the way, if you purchase your own copy of Drive, fill out this form and Daniel Pink will send you a free, signed bookplate to insert into your book. See mine? 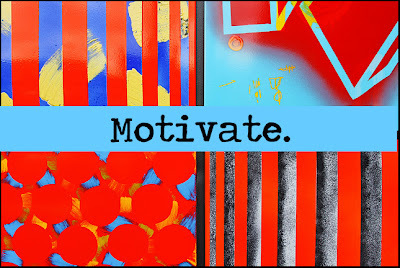 According to Pink, motivation has three essential elements: autonomy, mastery, and purpose. For humans to be intrinsically motivated (motivated from within oneself), all three must be present and balanced. Pink defines autonomy as the ability "to act with choice" and "direct your own life." Do your students have autonomy over the following Ts? Parents, do your kids? Time - Do your students have control over when they complete a task, lesson, activity or assessment? Task - Do your students have control over what task, lesson, activity or assessment they choose to complete? Technique - Do your students have control over how they complete their task, lesson, activity or assessment? Team - Do your students have control over who they work with to complete their task, lesson, activity or assessment? My guess, if you are in a traditional public school setting, is "no" on most of the Ts above. By the way, Montessori schools get yes-yes-yes-yes on all four Ts above. How's that for fostering autonomy in our youth? What do your students want to master? What do you want your students to master? Is there an intersection or commonality between the two? I heard Jonathon Mooney say that he worked with a student who was a successful drug ring leader. This student said he "wasn't good at anything." Mooney responded, "You run a successful 50 person drug ring and you think you aren't good at anything? Man, we just need to find you a new product." Money doesn't buy you purpose. Purpose typically shines through when students feel like they are a part of something bigger than themselves - a school community, a team, a club, a caring classroom, a loving family, etc. 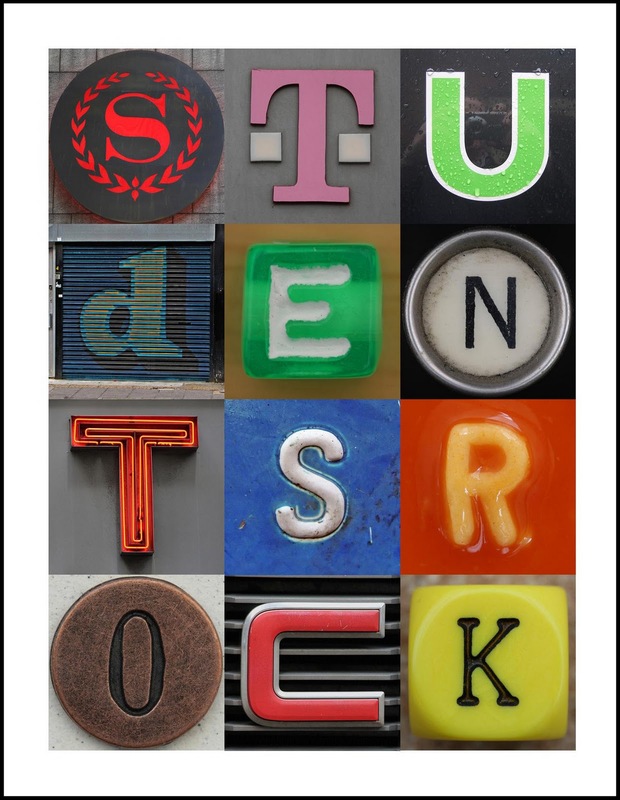 How can you help students identify their purpose? Have you started dedications with your students to foster purpose? "Here's another idea--I love to make science and math word problems that "hook" my middle school students. 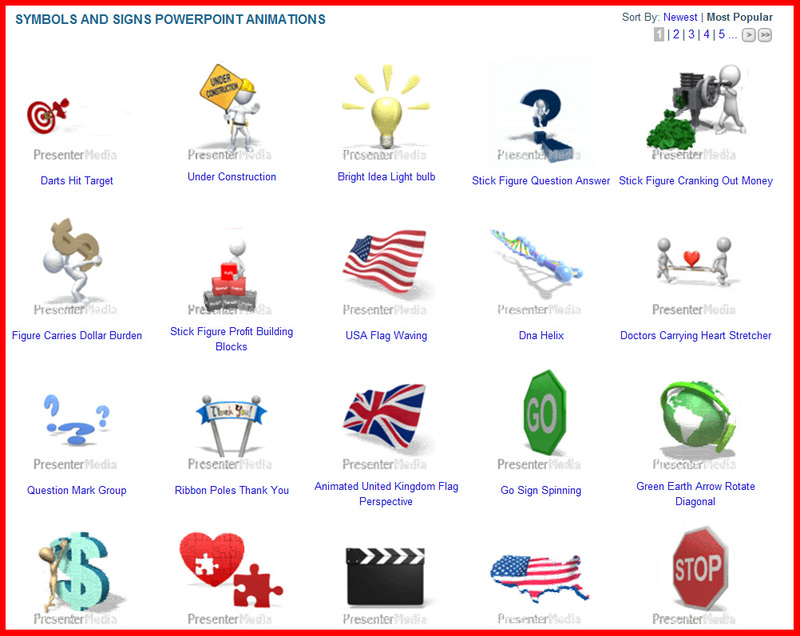 In addition to using student names and creating wacky scenarios, I think adding animation from this website would be a great way of keeping students engaged in critical thinking problems. I can see it already...A gecko was playing hoops one day (insert animation of gecko playing basketball!) and decided to calculate the density of the basketball...So great!" Congratulations, Star! 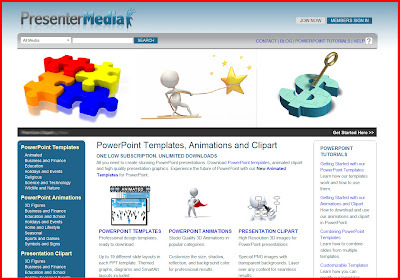 To claim your prize for a free, one year subscription to Presenter Media's collection of templates, animations and clip art, ﻿email me at jenglara at gmail.com. To all our entries, thank you for leaving your thoughtful comments. Say this last name five times fast (pronounced chick-sent-me-high-ee). Ready? Csikszentmihalyi, Csikszentmihalyi, Csikszentmihalyi, Csikszentmihalyi, Csikszentmihalyi. Kind of a mouthful, huh? This professor of psychology is brilliant. Maybe the more letters in your last name, the more brilliant you are. ...I only have four letters in my last name.....bad theory. Can you think of a time where you thoroughly enjoyed yourself? Where the minutes and hours melted away and you lost all sense of yourself? Blogging right now does that to me. If I didn't have to eat, grade papers or be a mom, I could type, innovate, and create for hours. That, my friendly blog reader, is "flow." 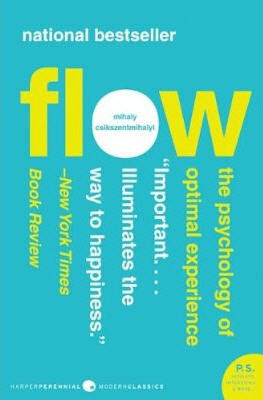 Mihaly Csikszentmihalyi describes flow, throughout his work, as "an intense emotional involvement" or "being completely involved in an activity for its own sake. [Where] the ego falls away. Time flies. Every action, movement and thought follows inevitably from the previous one....[where] your whole being is involved, and you're using your skills to the utmost." You are completely involved in what you are doing. You have focus and concentration. You have a sense of ecstasy - or being outside reality. You have greater clarity. You know what needs to be done and have a sense of how you are proceeding towards that activity, goal or task. You know the activity is doable and that you have adequate skills. You have a sense of serenity. You have no worries about yourself; you grow past the boundaries of your ego. You feel a sense of timelessness. You are focused on the present; the minutes and hours just slip away. You have intrinsic motivation. Whatever you are engaged in becomes its own reward. You work, learn or do for its own sake. Take that carrots and sticks! According to Csikszentmihalyi, the best way to get to a state of "flow," if you aren't there already, is to access it by one of it's neighbors - control or arousal. Control ﻿means you are comfortable with the current task or activity, but you are not in flow. To get to flow from here, you need to increase the challenge you face. Arousal is when you are over challenged, but your skill level isn't quite there yet. Think of Vygotsky's zone of proximal development. If you need a refresher, click here. In arousal, you need to be gently nudged to develop your skills. 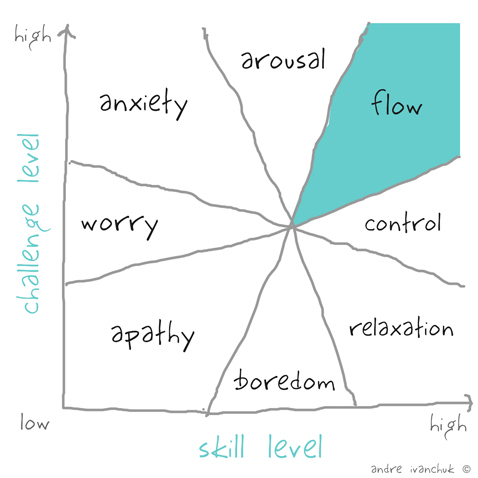 The less flow-like in the visual above is apathy - low challenge and low skills. Think complete indifference and absence of interest. Yuck. Have you ever had a student who felt apathetic? ﻿Next time you teach a lesson, engage in an activity or just do something you or your students love - sit back and observe. Are you in flow? Are they? If yes, high five! If not, how can you inch over to it? 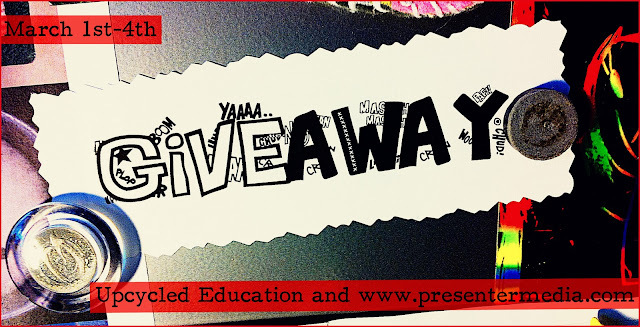 Have you entered the first ever Upcycled Education giveaway? Click on the image below for more information. A year ago, I took my first business class in entrepreneurial studies. The class title lured me because of these two words: creativity and innovation. Those seemed useful to me as an educator. The class was fantastic and my mind stretched. I couldn't help but think all semester long, "How can educators use these ideas in their classrooms?" 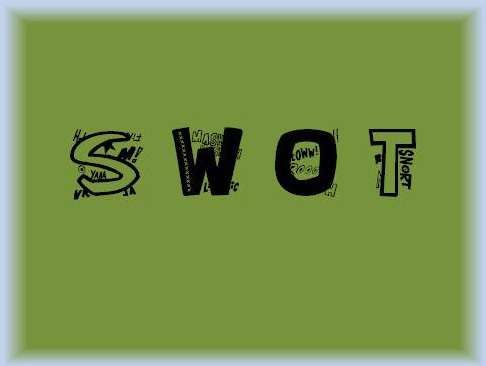 Today is all about "swotting" a lesson. Or in business jargon, doing a SWOT analysis. The next time you teach a lesson (which always includes teacher reflection in the lesson cycle, right?) or the next time you are crafting a lesson, consider swotting it. What are the strengths of this lesson? What worked? What were the greatest moments within the lesson? What did students enjoy most? What did you enjoy most? How did the lesson meet your learning objectives for the day? What are the weaknesses in this lesson? What part(s) of the lesson seem less engaging? Where did the lesson lose steam? What opportunities are available to improve this lesson? What other resources could you include? How can you provide extension activities for students who want to learn more? How can parents and families get involved? How can parents and families extend the learning at home? What threatens the lesson? How will you manage your resources and materials? Time? Budget? Volunteers? How will your lesson be impacted if technology is unavailable that day? Put on your business hats and see what other questions you can develop. Could you teach students how to SWOT their own work? 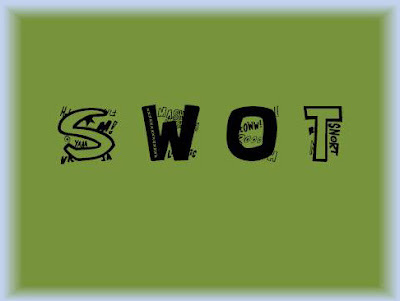 Could you use the SWOT analysis with the committees you serve? Please post your ideas in the comments section below. Off to write a business plan, I mean, lesson plan. PS - Did you enter our giveaway yet? 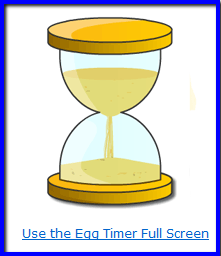 You have until March 4th, 2011 at midnight EST. Click on the image below for more details.